It is Jerusalem artichoke season and we have been having them quite a bit, but I always tend to have them boiled or roasted so when I saw this Jerusalem artichoke and celeriac soup with coconut and chilli from Cook Veggielicious it certainly got my attention. Celeriac soup is so creamy and with the addition of the artichokes I bet that this is a bowl of deliciousness! The following soup from Everyday Healthy Recipes is an all time favourite of mine but Monika's soup has an added extra. This Roasted Pepper, Quinoa and Basil Soup has an enticingly vibrant colour and the addition of quinoa makes this a filling bowl with added goodness! The third soup that I chose this week is another recipe that features Jerusalem artichoke but combined with a different vegetable. Jo's Kitchen Larder shared this Jerusalem Artichoke and Carrot Soup. Jo has kept the ingredients and flavours simple which has created a soup which I cannot wait to make! For me, if you have a bowl of soup, you must have some fresh bread to dip. That is where the fourth and final recipe in this round up comes in. This Algerian Semolina Bread from Jess Eats and Travels looks and sounds like the ideal accompaniment to any of these three warming soups. Now on to this weeks linky I cannot wait to see what you have been cooking up. Before I share the linky let me just recap the rules. Add the badge to the post that you are sharing so that others can find the linky. You can add up to 4 recipes, old and new recipes welcome but please do not add posts that you have shared in the past. Comment on either this post or the post that I have linked up and labelled HOST. If you Tweet me at @k_phillipson I will retweet and not forgetting if you tag my lovely co-hosts Eb Easy Peasy Foodie at @easypeasyfoodie, Jacqui Recipes Made Easy at @jacdotbee and Monika Everyday Healthy Recipes at @MonikasRecipes I am sure that they will share your posts! Over the week I will be commenting, Tweeting and pinning all of your recipes! Hi, Kirsty! Thanks a lot for hosting! Have a lovely week! I love homemade soups, these all look fantastic! That bread looks so good and would be perfect for dunking into any one of those delicious looking soups. Those soups look delicious and the bread just right to go with them. Its still certainly cold enough to want soup. Thanks SO much for including my soup Kirsty! So glad you liked the look of it. Those soups look so delicious and warming, exactly what we need right now. I’m really looking forward to the Easter holidays too! I'm still eating loads of soups at the moment too and it feels like I will be for the next few weeks as well. I bet you can't wait for the Easter holidays to catch up a little bit. All of those soups as well as Jess's bread recipe look perfect for the chilly weather we've been having. Not a lot beats a good bowl of warming soup. We are still decisively in soup season here in Wisconsin, USA, and I don't see that ending any time soon. So this roundup is very timely! I was drooling over Jo's Jerusalem Artichoke and Carrot Soup and Monika's Roasted Pepper, Quinoa and Basil Soup when I saw them in last week's linky. But these ALL look absolutely delicious. Thanks for hosting! 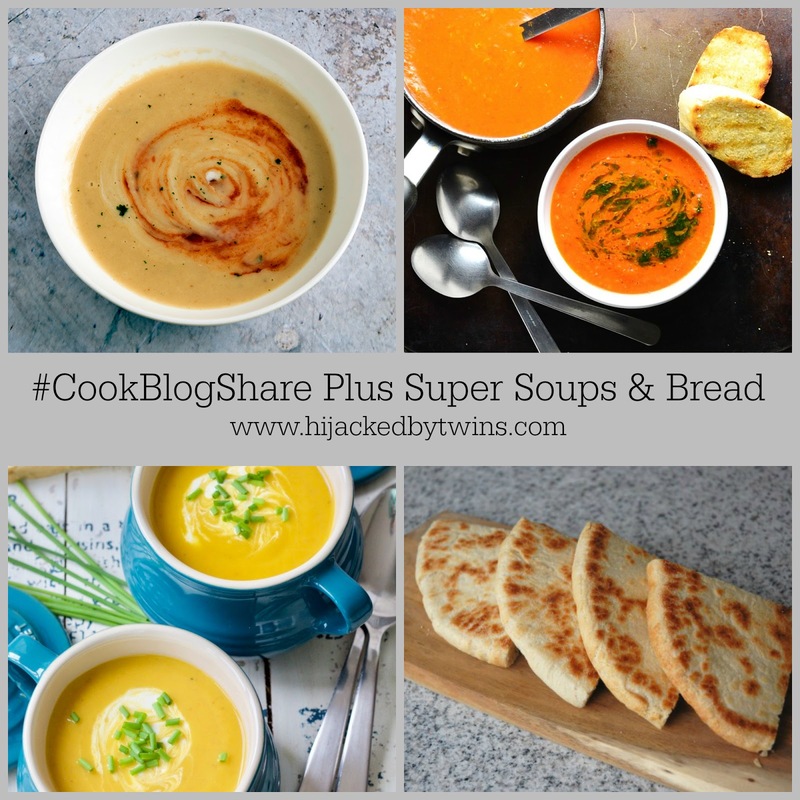 Delicious round up Kirsty, I've been working on a post this week for soups-for-one, it's definitely been a soupy kind of week!